Airway diseases -- These diseases affect the tubes (airways) that carry oxygen and other gases into and out of the lungs. These diseases cause a narrowing or blockage of the airways. They include astha, emphysema, and chronic bronchitis. People with airway diseases sometimes describe the feeling as "trying to breathe out through a straw." 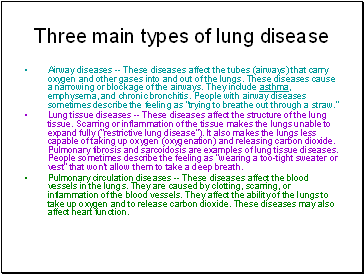 Lung tissue diseases -- These diseases affect the structure of the lung tissue. Scarring or inflammation of the tissue makes the lungs unable to expand fully ("restrictive lung disease"). It also makes the lungs less capable of taking up oxygen (oxygenation) and releasing carbon dioxide. 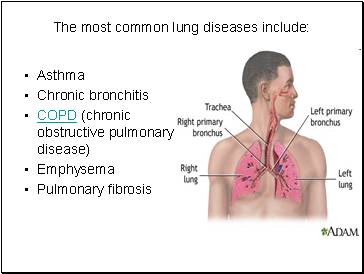 Pulmonary fibrosis and sarcoidosis are examples of lung tissue diseases. People sometimes describe the feeling as "wearing a too-tight sweater or vest" that won't allow them to take a deep breath. Pulmonary circulation diseases -- These diseases affect the blood vessels in the lungs. They are caused by clotting, scarring, or inflammation of the blood vessels. They affect the ability of the lungs to take up oxygen and to release carbon dioxide. These diseases may also affect heart function. is an inflammatory disorder of the airways, which causes attacks of wheezing, shortness of breath, chest tightness, and coughing. Astha is caused by inflammation in the airways. When an astha attack occurs, the muscles surrounding the airways become tight and the lining of the air passages swell. This reduces the amount of air that can pass by, and can lead to wheezing sounds. 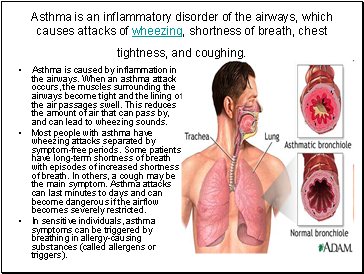 Most people with astha have wheezing attacks separated by symptom-free periods. Some patients have long-term shortness of breath with episodes of increased shortness of breath. In others, a cough may be the main symptom. Astha attacks can last minutes to days and can become dangerous if the airflow becomes severely restricted. 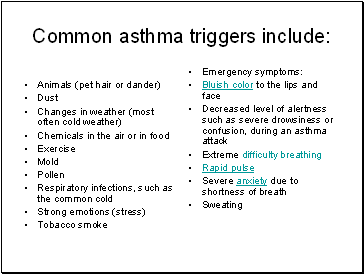 In sensitive individuals, astha symptoms can be triggered by breathing in allergy-causing substances (called allergens or triggers).